Nabuur.com is a volunteer platform created in 2001 with a belief that in order to bring human ingenuity to bear one needs community. Founded by Siegfried Woldhek, a former director of the Dutch branch of the World Wildlife Fund (WWF), the site was designed to link neighbors (online volunteers) with villages (local communities) in Africa, Asia and Latin America, creating direct connections between individuals outside of large institutions like WWF. More than 30,000 members have participated over the years, forming new relationships across the globe and sharing knowledge that’s led to new schools, community-based education models, a hospital in Zambia, Internet cafes and farmers adopting permaculture approaches. When the site ran out of funding in 2009, the platform was turned over to volunteers to manage. While usage has dropped dramatically, and building long-term engagement was always a major challenge, in the past two weeks 150 people have logged onto Nabuur, and 50 per cent were returning users. Thinking of the future of Nabuur, and how new platforms and models can connect citizens horizontally, Nabuur director Pelle Aardema was one of 15 leaders to take part in a half-day Mob Lab meeting exploring best practices and challenges to volunteer platforms. Called a Spark Summit, the event was organized by Anna Keenan, movement building and climate and energy campaigner at Greenpeace International, and Michael Silberman, global director of the Digital Mobilisation Lab. 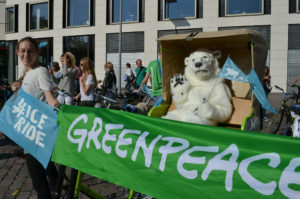 Anna says the topic was timely as Greenpeace International is developing its own site to connect activists, called Greenwire. They are also part of a community of organizations seeking to understand how to mobilise more people to become changemakers. “I think there is a lot more time and energy that people are willing to give, in creating positive change in the world, than we are able to centrally co-ordinate,” says Anna, on the potential of volunteer platforms. The Spark Summit happened on the ground in Amsterdam and Washington DC, while others from across the globe joined by video conference. Almost every participant attending was working on a different kind of volunteer platform: from the 1 %PROJECT, which is a crowd-sourcing platform for social projects, to 350 Local, which is empowering climate activists to build a movement for climate action in their community. Each participant was asked to share their key challenges, big successes and big failures. Similar concepts were clustered, and the group broke into themed discussions. Anna says the event was about learning and building community among a group that often doesn’t have support. “Probably within each organization these people are working in, they are the sole practitioner. So, they are philosophising deeply about how to run a platform and yet they don’t have people to bounce ideas off, or share challenges and hear how others have overcome those challenges,” she says. Despite every participant building a platform to fulfil a unique need, Anna says many of the challenges in creating volunteer platforms were the same. A common challenge shared by practitioners is how to grow and sustain an online platform without staff members driving it. One participant commented how staff are always the most active on the site, while others expressed difficulty at encouraging offline action without staff support. Suggestions to overcome some of these challenges include focusing on a platform’s most active users with a goal of supporting them in driving the community, to the crucial role newsletters and social media can play in reminding people to return to the site and connect. A lack of knowledge of the process or philosophy of the platform can also prevent people from engaging. There was discussion about the need to develop clear cues in a site’s design that will lead and simultaneously educate users about the process. A final suggestion was a regular “cleaning” of the community, in order to remove inactive campaigns, making it easier for new members to find effective projects and groups to join. When looking to deepen user engagement, and develop activists and offline action, participants recommended having the organization hosting the platform to offer campaign training, followed by developing a peer-mentor training model. Anna says she was intrigued by the tension between a hands-off approach to volunteer platforms, and the need to provide enough guidance and leadership to users. “Sometimes when an organization is going through a transition from a top-down approach to a bottom-up, horizontal, networked approach, they swing too far in the new direction,” she says, adding it was a valuable insight. For Pelle, who attended the meeting in person, he was also able to gain valuable lessons from participants, including 350.org’s use of country co-ordinators when managing a global platform, to Invisible Children’s successful volunteering recruitment model. “I really enjoyed the diversity, it gave me some very good insights,” he tells Mob Lab. 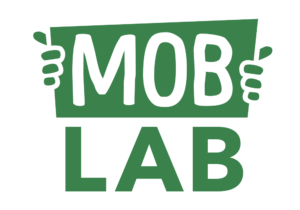 This was the second Spark Summit hosted by Mob Lab, which are small, informal, half-day gatherings of practitioners who come together to step back and “talk shop” in ways that don’t otherwise take place online, over e-mail, or at large conferences. To learn about the first Spark Summit in July on online and offline organizing, click here. For more information on future Spark Summits, contact moblab@greenpeace.org.